Hold on. Baby just moved. I must, literally, run to the bathroom. Dang you, bladder. I’m sorry to begin a post with such tasks as running to the bathroom, but such is life these days, my friends. Speaking of which, the baby’s nursery is dang near complete. The dresser is finished and all the little pieces are coming together. Once Stuart finishes the sheep picture I requested to fill a blank frame, I will show you all the before and after photos. I’m so excited! But until then, there are lots of other goodies to share. The first of which is a new lacto-fermented recipe. Regardless, when I found myself staring down a small mountain of Meyer lemons that I’ve been collecting in my CSA basket these last few weeks, I knew I needed to do something with them. 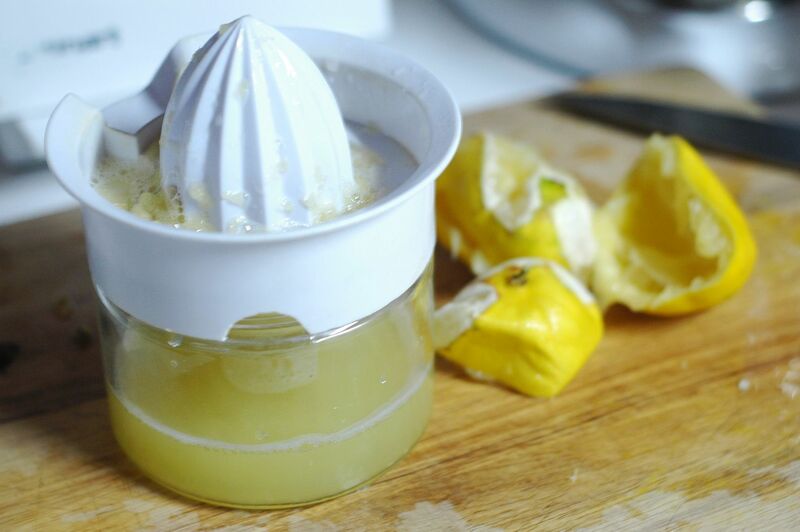 …or this fabulous lemon curd…. 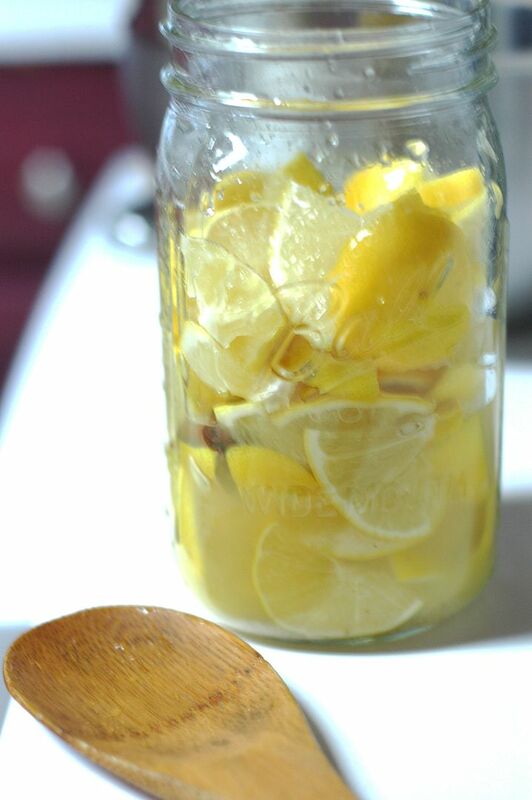 …but I wanted to make something that would help me to preserve the lemons through the winter. Even though we’re just getting into the heavy citrus season around here, I’d still like to have some on hand. Girlfriend can’t ever run out of lemons. I use them far too much. That being said, I turned (where else?) to my right-hand-man in the kitchen: Nourishing Traditions. 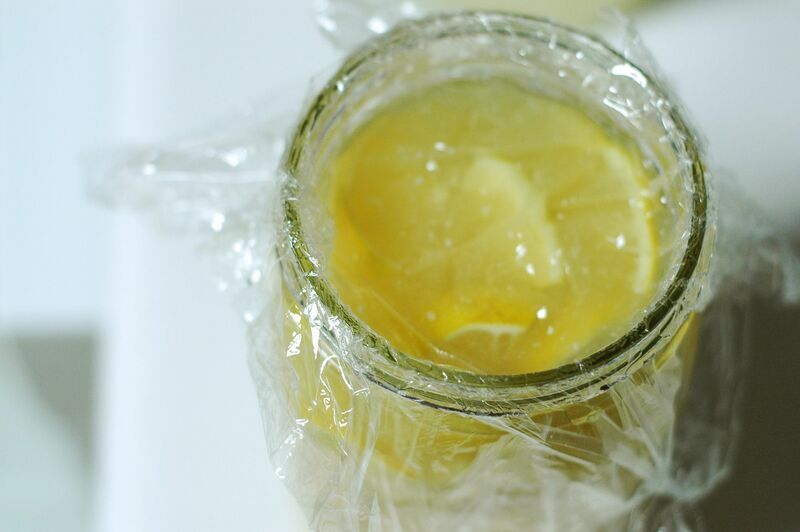 Because I’d never made preserved lemons before, I followed Sally’s recipe (almost) completely. I trust her experience. Start to finish, these preserved lemons took about ten minutes to get fermenting. So it’s an easy project to slip into your crazy day. Step One: Cut your five lemons into thin slices. Then, quarter the slices and transfer to a bowl. Step Two: Add in the sea salt and cinnamon sticks. Stir to combine. 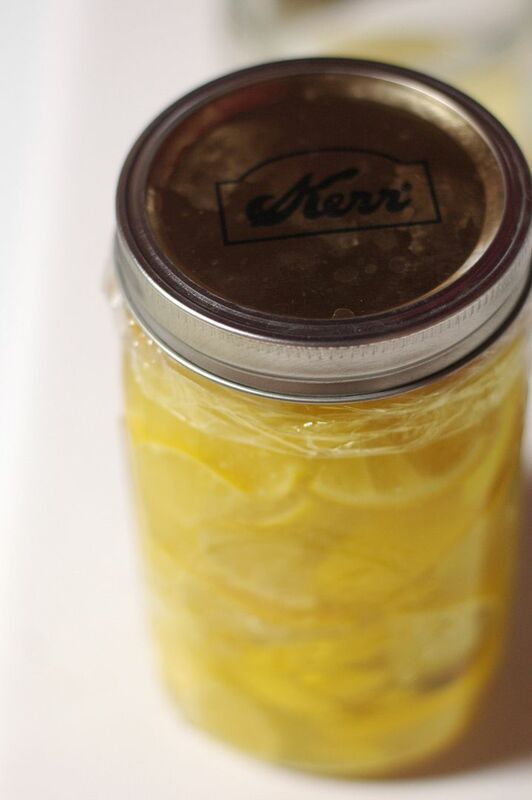 Step Three: Scoop the lemons into a clean, wide-mouth, quart-size Mason jar. 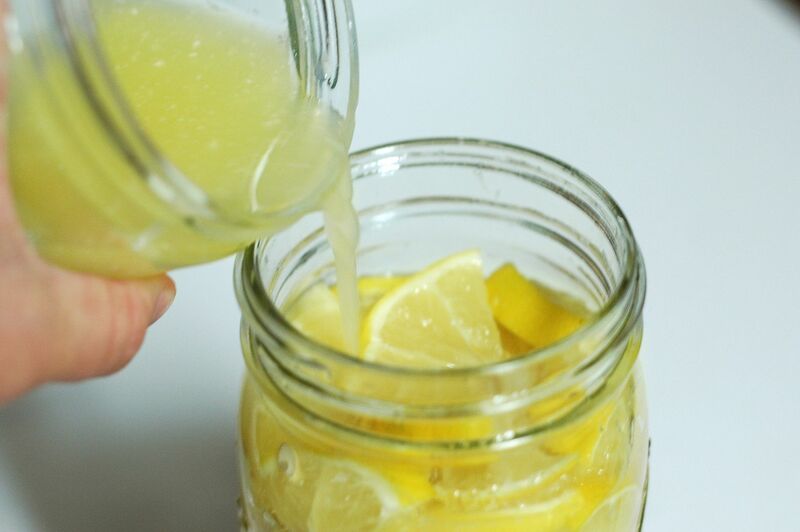 Smoosh the lemons down gently with a wooden spoon to help them release some of their juices and to help them all fit in the jar. See how much more room I just made?! Step Four: Combine the whey and the juice of the last two lemons. 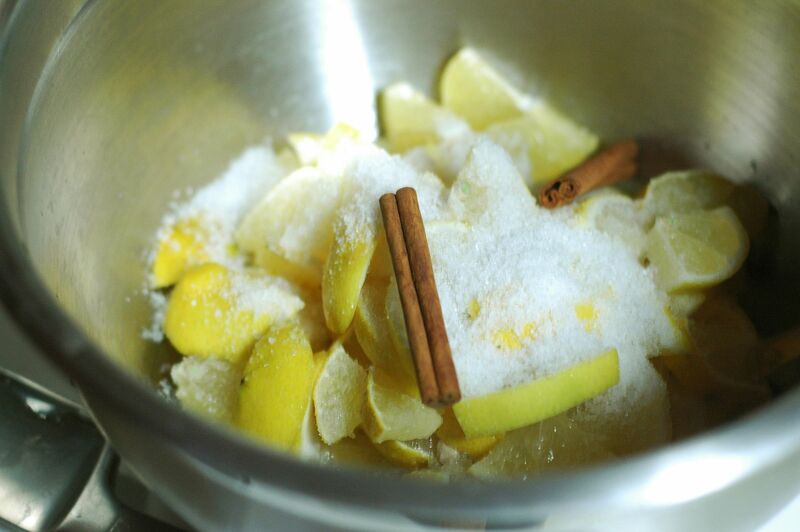 Pour this over the top of the lemons until the liquid reaches an inch below the top of the jar. 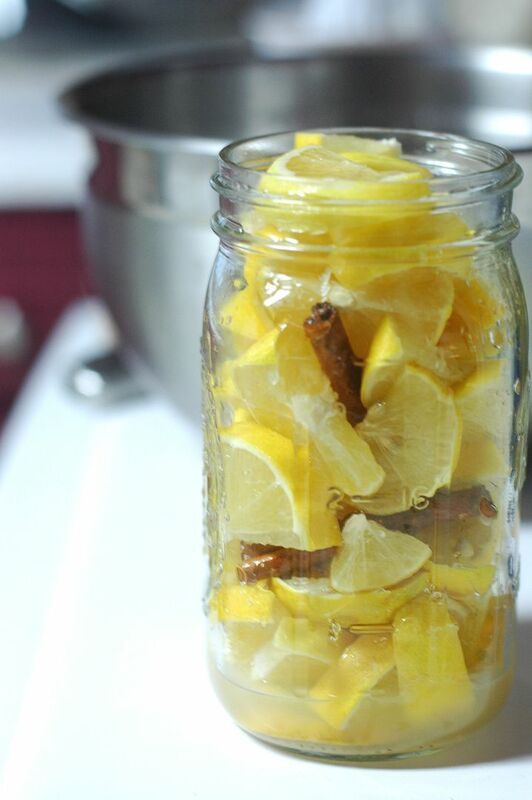 Step Six: Leave the lemons out on your counter for 2 weeks, giving the jar a quick turn upside down each day. 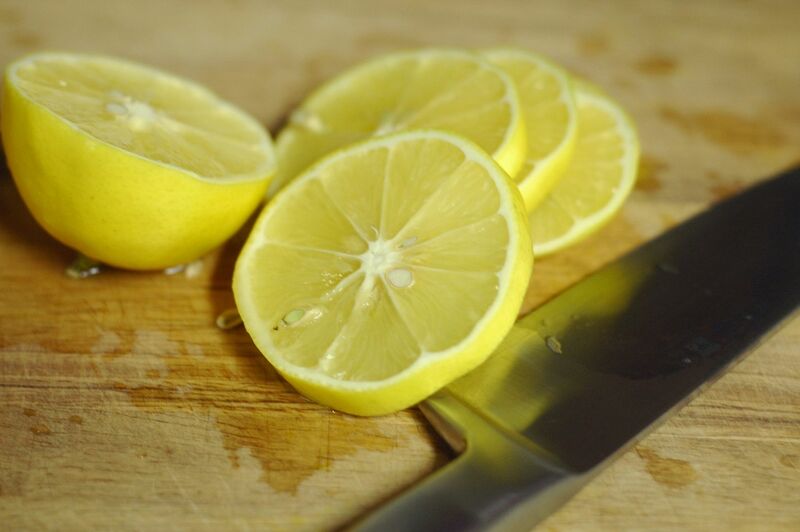 During this time, the lemons will develop lactic acid and all sorts of beneficial bacteria. You can read more about the benefits of lacto-fermentation here. 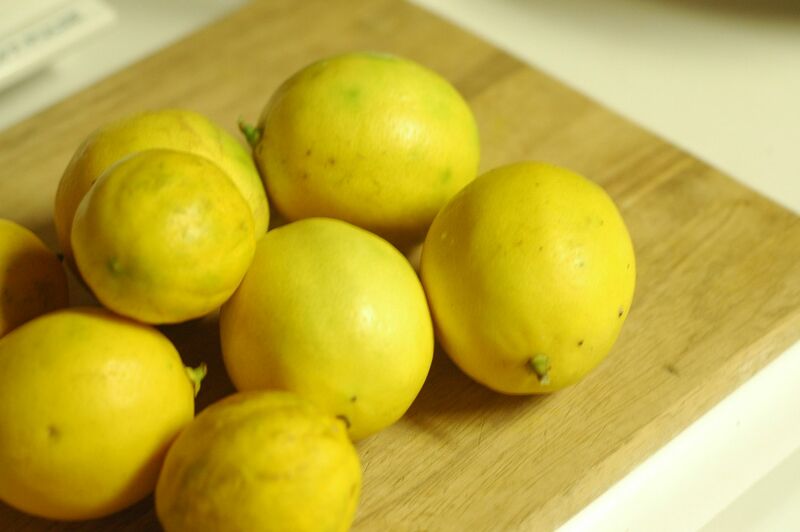 After this two week period, transfer the lemons to your refrigerator where you can enjoy them for months to come. Note: If you don’t use (or have) whey, you can find a salt-only recipe here. 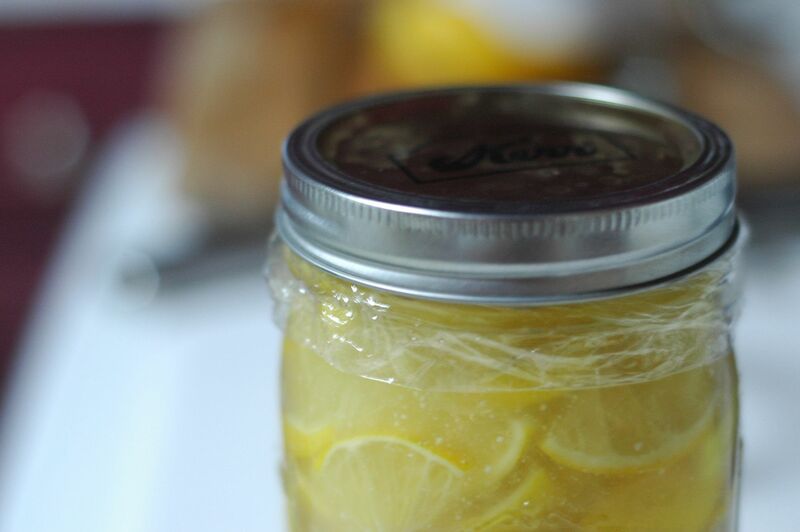 Nourishing Traditions uses preserved lemons in a lot of their recipes. And though this is my first time making preserved lemons, I’m inspired to utilize them in a variety of ways. Maybe it’s the nesting kicking in, but I’ve been super motivated to fill the fridge and freezer with good food. I’ve got a double batch of soaked whole wheat bread on the counter right now (the loaves freeze great!) and I have plans tomorrow to put up a few extra batches of granola and beef stock. 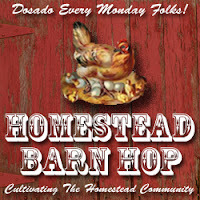 I’ll also be making a trip to our local rancher this week to stock up on some more delicious grass-fed beef. Girlfriend can’t be too prepared. These preserved lemons were a good start. « Sparks in the love fire. What can you do with them? I have the book, but darned if I have missed the recipe on fermented lemons! Can’t wait to here what you do with them this winter! I would love to hear the ideas for using the lemon slices!! I decided days ago I would be making your nourishing lemon bars today, thanks for the motivation! I almost wish you did follow up posts to your posts, it always seems like I have so many questions. I wish I could just pick away at your brain. In fact, if you did a ‘Shaye answers your questions’ post, I would love it!!! Im sure Im not the only one who has questions for you, and would love to hear all your answers! Can I use the whey from store bought yogurt? If you don’t have access to fresh whey, I’d use the extra salt instead. So I’m trying to make lemon pickle. Not sure what I’m doing. I have lemons that popped out of the liquid. One jar started to mold. Can the top be removed and is the remaining lemons safe to eat? I have 3 jar and only 1 molded. My Plan is to toss the molding jar.